For the new owners of Cobweb Cottage, spiders were the least of their problems. Crumbling timbers and limited space were far bigger concerns. The tiny cottage, measuring just 16 square feet, had belonged to the same people since the early 1950s and little had been done since. Be inspired by the reinvented space, look at our other real home transformations and find out how to renovate a house in our guide. A galley kitchen and basic bathroom were shoehorned into the sole downstairs room, while the bedrooms were part open to the sky through a thatch that was long overdue attention. When the two elderly owners passed away, the cottage was put up for auction. Carl and Alison viewed it and even though it was falling apart the couple were smitten. Straight after their winning bid the couple went to see exactly what they had bought. ‘We knew it was a special place and that we could do something good with it, but we bought it without even knowing whether we’d get planning permission.' recalls Carl. ‘The first architect told us we wouldn’t get permission for anything,’ says Carl. ‘But then we called in Alan Simcox from Nick Joyce Architects, who the surrounding Spetchley Estate uses, thinking that he would know what was possible in the area. I’d done my own drawings and his finished plans were an architect’s translation of my ideas,’ he adds. They submitted the plans and, after a long wait, the couple’s application was successful and they geared up for the build. Carl project managed it, and helped out. On day two of the build, builder Paul Wood broke the news that the cottage needed underpinning. The timbers were rotten up to one-and-a-half metres, so it all had to be acropropped and the sole plate replaced. The Coopers were keen to preserve as much of the original building as they could. Anything they had to replace, they used like for like, using traditional methods. A new sole plate was constructed from hand-cut, air-dried English oak with the pegs to secure the timbers created from the offcuts and the home slowly took shape. The cottage first, then the kitchen extension, and finally the guest annexe. Carl had been collecting inspiration for the interiors since the auction in August 2012, and says the living room dictated its own décor. 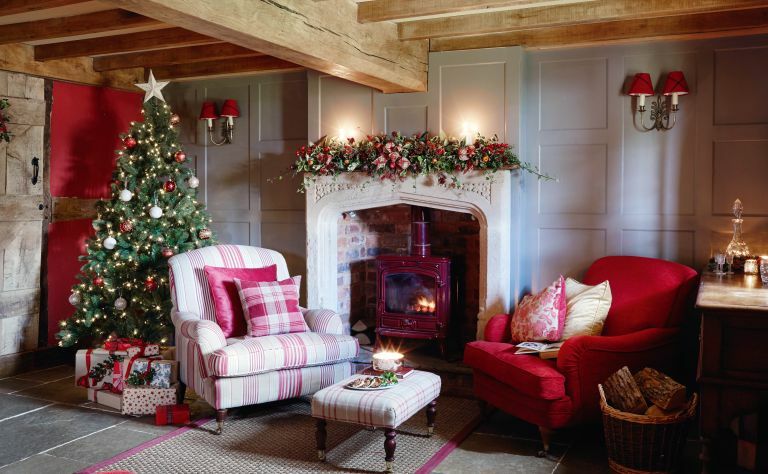 The deep red paint and grey panelled walls complement the old timbers perfectly and it never looks better than when it’s decorated for Christmas.